"For the farmer, there's nothing to appreciate about a pesky fox stealing poultry form the henhouse. But for the fox's kits, there's nothing like the triumphant return of dad with food to the den, and for the listener there's nothing like Tom Chapin performing this well-loved folk song. 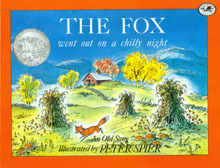 As narrator, Chapin is direct and unobtrusive as he lets Peter Spier's award-winning illustrations share the story. Background music is light, and well selected sound effects heighten the setting. Chapin's music brings animation and pleasure. The fox's step is quick and light; Mother Giggle Gaggle is indignant; the hunting horns, majestic and the feast, resplendent. Children will enjoy the "quack, quack, quack" and "bones-o, bones-o" refrains."